The cycle was simple. And cruel. When they stopped using pain pills, they’d need meth to feel better. When they stopped using meth, they’d need pain pills. Kimberly Hoyt and her husband couldn’t stop shaking. Then they couldn’t stop sweating. They were in a revolving door of withdrawal symptoms. Among the low points was a car wreck on the state road from Great Falls to Browning in 2009. To treat their injuries, a doctor in Great Falls prescribed hydromorphone, a highly addictive painkiller. They shot up most of it in the hospital parking lot. One morning, a few months later, they couldn’t get out of bed. The couple rolled over to look at one another. Enough was enough. They went to Blackfeet Community Hospital, the Indian Health Service facility on the Blackfeet Indian Reservation. Doctors said they detected enough opioids in their blood to kill them. Behavioral Health decided to send them to a treatment center in Kalispell called Pathways, but only one at a time. Kimberly went first. She was crying in pain, and the withdrawals were causing her to vomit by the time she arrived. The doctor who assisted her ended up sticking by her for years, walking her through a treatment that replaced her addiction with other, increasingly weaker drugs. Hoyt remains grateful to him to this day. “He was telling me about this new medicine that came out in the state of Montana, and that’s Suboxone,” she said. Suboxone is a buprenorphine-based drug used in medication-assisted treatment. The drug, if administered carefully, alleviates the symptoms of withdrawals and can allow patients to wean off even the most addictive drugs, according to the Substance Abuse and Mental Health Services Administration. However, these prescription drugs are regulated differently. First-year doctors can only prescribe Suboxone to 30 patients at a time. They can apply to SAMHSA, which would increase that patient cap to as many as 275 patients. For Hoyt’s doctor, she was number 27 of 30. It worked. Hoyt spent two weeks at the treatment center and her pain subsided. Her doctor sent her home with a Suboxone prescription. Then it was her husband’s turn. His was prescription number 30. The doctor regularly decreased the dosage of Hoyt’s prescription until eventually, she and her husband no longer suffered withdrawals. They will be seven years sober in October, Hoyt said. 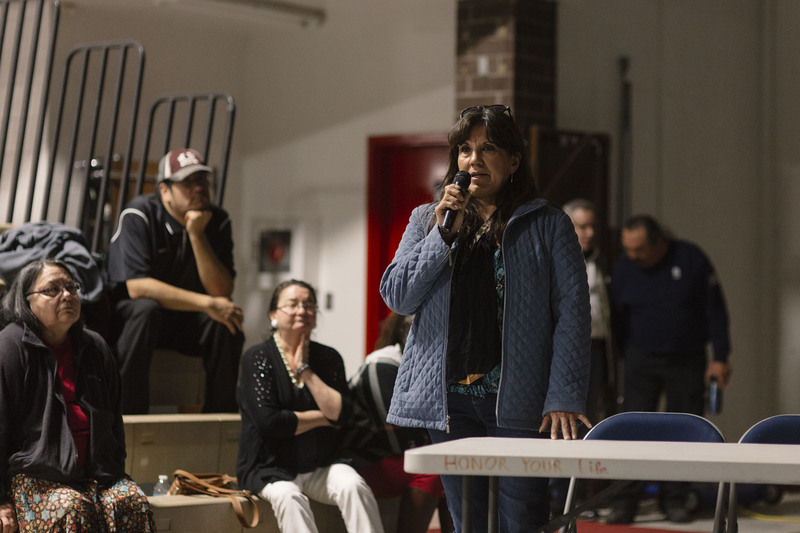 About 300 people from the Blackfeet reservation receive Suboxone from two clinics in Cut Bank and Great Falls alone. However, Suboxone is controversial. The prescription drug is itself potentially addictive. A Blackfeet Community Health Assessment released this spring cited it as the latest illicit drug to gain a foothold in the community. Blackfeet Law Enforcement Services say it’s the most common drug sold on the street, becoming as prevalent as meth and other pain pills. Communities like Browning are divided on both the proven benefits and the proven health concerns of Suboxone. The Blackfeet IHS Service Unit neither stocks the drug nor has a doctor who can prescribe it, but it still contracts patients to buprenorphine clinics off the reservation. Citizen groups are taking to the streets to break the silence and advocate for new, culturally based programs. Today, people still seek advice from Hoyt, now 41, and she shares her story with them. Even some of Hoyt’s friends speak openly against Suboxone, concerned about its widespread abuse. Her friend John Dog Monroe, who used drugs with her in the past, said that Suboxone gave him worse withdrawals than meth. Like Hoyt, he too overcame his addiction and is now raising a family. He got clean in jail. He said that even though he knows Suboxone helps people, there are others who abuse it. Suboxone combines buprenorphine — a narcotic painkiller used to treat narcotic addiction — with the anti-opiate naloxone, which reverses the effects of opioids. Some studies show that Suboxone has successfully weaned half of its clinical patients off opioids and improved quality of life for its users, preventing relapse. This specific concoction is essential for Suboxone to work. Dr. William Reiter has prescribed buprenorphine in Montana for 15 years. He is the medical director for the Helena Indian Alliance and Northern Winds Recovery Center in Browning. Reiter is concerned that the abuse rates for drugs like buprenorphine could increase because without naloxone, it can be used intravenously to achieve an opioid-like high. There are fewer than 30 medication-assisted treatment doctors in the state, which means there are thousands of patients without access to medication-assisted treatment. That leads to desperate addicts who seek out Suboxone illegally, Reiter said. Medicaid covers Suboxone, but out-of-pocket, a monthly supply could cost up to $350. The noticeable difference between Hoyt and others who wind up addicted to the medication is the relationship she had with her doctor. Assessing patients for addiction and keeping them on track takes a great deal of time and face-to-face interaction with doctors. Hoyt and her husband used Suboxone for two years, with the doctor checking in every few weeks. This monitoring was key; missing a dose could cause withdrawal symptoms and cravings for other drugs. There is also a constant threat of relapse and possible overdose. The doctor called Hoyt regularly and randomly to demand pill counts. He was making sure she and her husband were using their drugs appropriately and not diverting them to other people. They were also subject to random drug tests. These are common practices in diversion prevention. The reality, Reiter said, is that some medication-assisted treatment clinics do not monitor patients as well as others. There is no detox center on the Blackfeet reservation, only limited-capacity treatment centers. 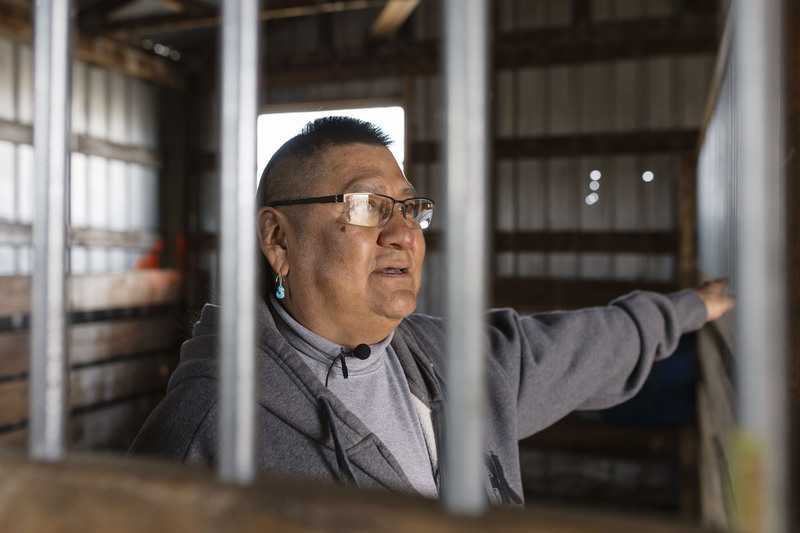 Before John Dog Monroe went to jail, he knocked on the door of the tribally run Crystal Creek Lodge in Browning, which is partially funded by the Indian Health Service. He asked for help, but the 20-bed facility mainly focuses on alcohol treatment. Employees turned him away. Leland Thomas knew he hit rock bottom when he nearly lost his life from liver failure after lifelong drug and alcohol abuse. Thomas repeatedly used the IHS services available in Browning to get clean. He now leads Narcotics Anonymous meetings and is pursuing a certification to be an addiction counselor. He was forced to turn to the primary health care provider for the reservation, the Blackfeet Service Unit of IHS. He was only admitted after threatening self-harm. Blackfeet Community Hospital and a clinic in Heart Butte are intended to serve over 7,000 tribal members a on a 1.5-million-acre reservation. IHS claims on its website to be “efficient with resources provided by Congress,” spending only $4,000 per person per year, about half the national average for health care. That doesn’t necessarily translate to good care if you ask any resident of Browning. Blackfeet Business Council Member Timothy Davis worked for IHS for most of his career and said the drug problem is one of the most important facing the reservation and state. 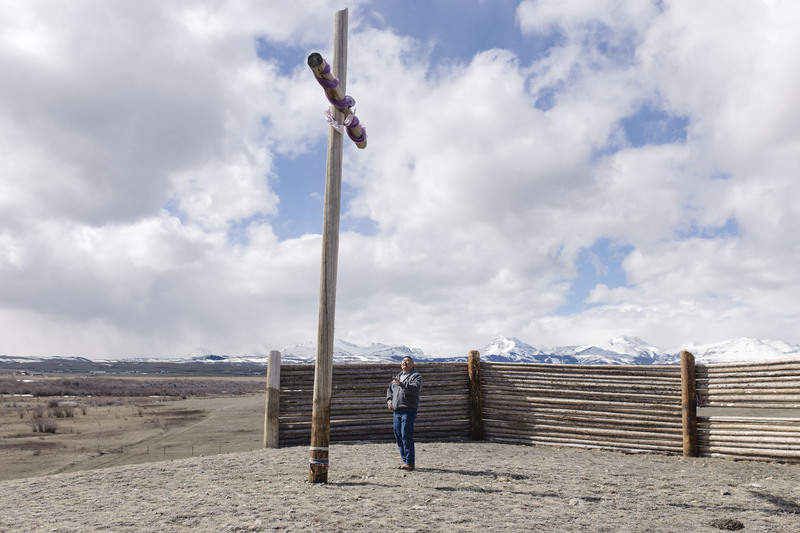 Like many reservations, substance abuse is a priority on the Blackfeet reservation. Suboxone is just the latest of those prescriptions to arrive, and while it has helped people recover, Davis understands that replacing one drug with another has challenges. Earlier this year, the Washington state-based addiction medicine company Ideal Option opened a clinic in Cut Bank. It’s now the closest place to the Blackfeet reservation that will fill a Suboxone prescription. It’s also just one of five locations in Montana and the only one not found in a larger city. Ideal Option CEO Dr. Jeff Allgaier said that Cut Bank was chosen so that patients from the reservation would not have to drive all the way to Great Falls for treatment. When the clinic opened, it was met with some concern from the Blackfeet community. He is aware that a few patients at the clinic could be illegally selling their prescriptions back on the reservation. He thinks that those individuals give the clinic an unfair reputation. Ideal Option has a diversion plan in place. The program’s policy states that pill counts can be enforced, and that patients diverting their prescription through selling or sharing are subject to treatment termination. The Blackfeet IHS Unit said it does not contract patients to the Ideal Option clinic, according to the Billings area IHS office. They declined further comment. Due to the severity of abuse in the area, Allgaier said that a new program and additional staff for the Great Falls and Cut Bank clinics will conduct observed urine drug testing and full-body searches for track marks, which indicate intravenous abuse. The unfortunate side of that, he said, is that the invasion of privacy may deter patients from seeking help. Still, law enforcement is concerned about the hold that buprenorphine has on the Blackfeet reservation. 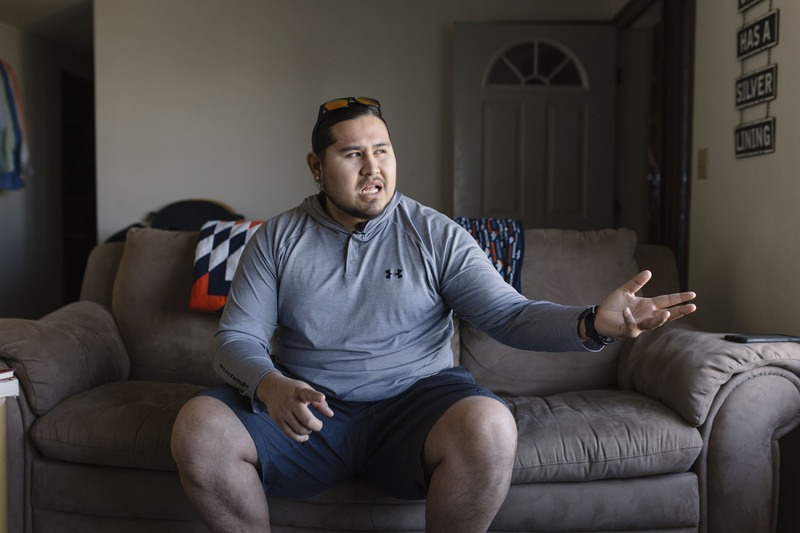 According to Andrew Castillo, Blackfeet Law Enforcement Services Drug Agent, patients can get large buprenorphine prescriptions from these clinics, take their dose, give the rest to family and friends and never be held accountable. The problem, he said, is just as rampant in Cut Bank and Great Falls. “For a high poverty rate, it’s easy to make money selling what you get,” he said. Eight-milligram Suboxone strips sell for anywhere from $40 to $80 each, according to the community health survey. Adding to the concern of Suboxone prescriptions is the use of telemedicine technology. Patients have the opportunity to communicate with doctors in Washington from Ideal Option clinics via video conference for treatment. Sometimes, those doctors will change. Given the close contact she kept with her doctor throughout her treatment, Hoyt said this isn’t enough. Allgaier said it’s just like any other doctor visit. Patients will typically visit every two weeks, when routine checkups and paperwork are conducted by staff. Since it only recently opened, Cut Bank Ideal Option is the only clinic without a full-time physician on staff. Allgaier said he is open to working with the reservation on creating plans to reduce illegal selling and abuse. Wary of the paradox of using drugs to combat drugs, community members are uniting in hopes of inspiring a new, cultural and community-based solution. The Browning Middle School gym filled on a Thursday evening. Grandmothers, mothers, and children shared snacks and filed into fold-out chairs. About 50 people were in attendance, with noticeably few men. 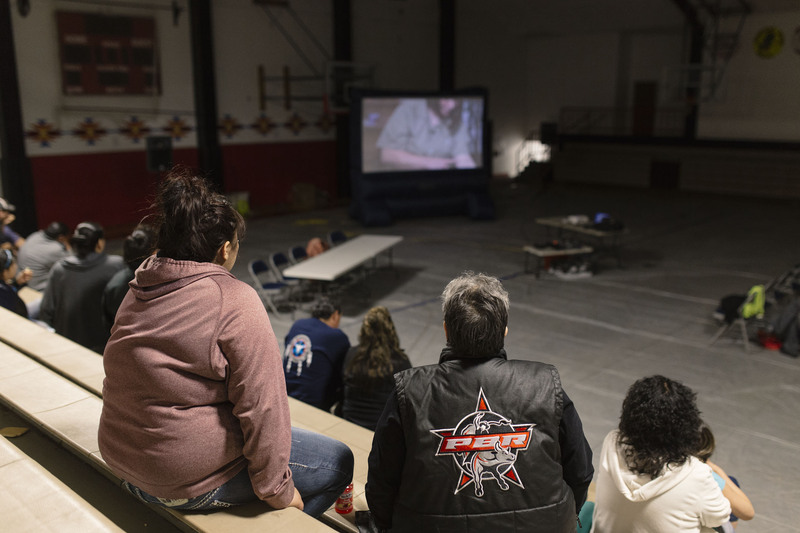 After a short introduction by Director of Blackfeet Tribal Health Rosemary Cree Medicine, the lights dimmed and the digital projector flashed onto an inflated movie screen. action to overcome opioid abuse. The 2016 FBI-produced film “Chasing the Dragon” documented the lives of Americans addicted to prescription drugs and the lengths they went to to get high. Some overdosed, some went to jail. Every terrible facet of drug use was front and center. The audience winced when the film depicted a woman using gutter water to shoot up heroin. After the film, a panel of seven local health and mental health professionals, including Reiter, took a seat at the head table to lead a discussion about drug abuse. Browning resident Dawn Douglas-Holt, 56, sat unassumingly behind the panel members, out of the audience’s sight. She had spoken to groups before, but never one of this size. Holt hid her head in her hands, knowing that she was about to be called to speak. She stood up with an embarrassed smile and took the microphone, brushing her bangs aside to look out over the gym. Children scuttled up and down the wooden bleachers behind her. Their guardians leaned in to listen. Holt’s story was like many addicts. Her addictions progressed from one drug to another, eventually leading to meth. She traced her addiction back to childhood trauma, which caused the need to alleviate pain. That addiction harmed the people around her. Since 2010, her addiction only got worse. It took her five visits to treatment centers and four visits to mental health services before she could stop relapsing. Now she leads Narcotics Anonymous meetings and speaks out to the community about recovery. Dawn Douglas-Holt, a recovering drug addict, speaks to community members during a discussion panel on community drug abuse. She sat down beside the panel, to applause. Mary Ellen LaFromboise, director of Blackfeet Tribe Child and Family Services, suggested that families put children first. Her service has over 200 children and infants suffering from behavioral problems. Everyone has a sad story, something tough in their lives to deal with, she said. LaFromboise suggested challenging the medical community to find an alternative to prescription drugs. Moving forward, she asked the audience to practice tough love and to speak out. Otherwise, she said, the next film will be about the Blackfeet Nation. Reiter took the microphone to ask the audience to keep an open mind about medication assisted treatment, receiving some applause of approval and some skepticism. In the fall of 2016, LaFromoise’s grandson, Terrance LaFromboise, 27, organized groups to march through neighborhoods where known drug dealers and addicts lived. He would sing and drum as a few dozen of the Silent Warriors Coalition marched behind him, holding homemade signs saying “Stop Killing Our Kids” and “Just Stop.” Men, women and children held hands and prayed. 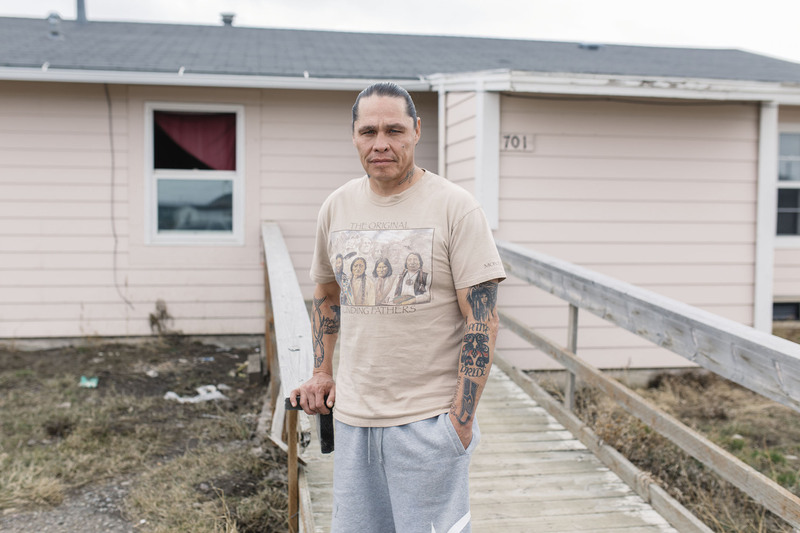 Terrance LaFromboise helped found the Silent Warriors Coalition, a group of community members concerned about drug abuse on the Blackfeet reservation. The Silent Warriors often host prayer walks during which they drum and sing in the neighborhoods of known drug dealers. They marched in Babb, East Glacier and Heart Butte—covering all the areas on and around the reservation where they felt prayers needed to be heard. John Dog Monroe, a founding Silent Warrior, said grandmothers and children walked out of houses to join them in some neighborhoods. In others, people peered out nervously. At his pastel-pink house, the 53-year-old discussed recovering from meth addiction without medication-assisted treatment. Thomas, used the services offered in Browning to save his life. He consistently went to Crystal Creek Lodge and other treatment centers in the region. Like Monroe, the most important one he found was in jail. “People didn’t want to help me. But when you jump on that sober wagon and people start seeing that you’re trying to help yourself, then they will help you. You just got to seek them,” he said. He was sober for almost four years until he relapsed in February. His parole officer called it strike one, but Thomas is confident he’ll never use again. Thomas has tattoos all over his body, many of which he garnered during his time in prison. 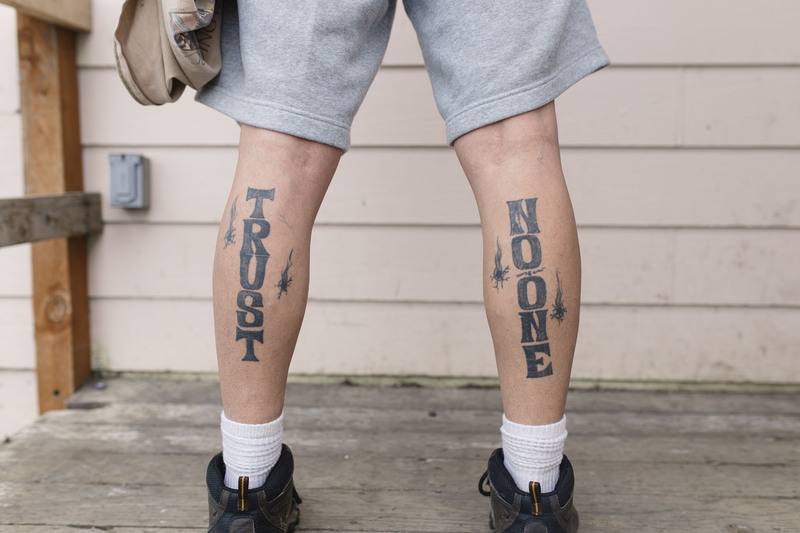 “Trust no one” is his life motto, he said, except God. He occupies his time with behavioral health classes at Blackfeet Community College, where he is excelling. He recently married, is improving his painting skills and gets out to fish as much as he can. Traditional sweat lodge ceremonies are also a favorite of his. He knows that in a few years, he’ll be a drug counselor helping people that were just like him. He already has brought friends to, and led, Narcotics Anonymous meetings alongside Douglas-Holt at the IHS hospital meeting room. For past Native News editions visit the archive here. Native News Project 2017 | The University of Montana | School of Journalism.